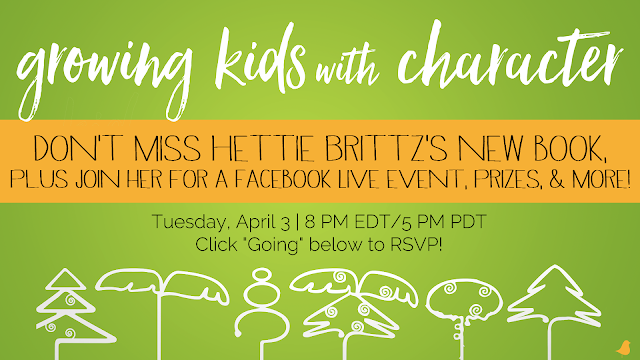 Hettie Brittz, author of the newly released Growing Kids with Character (David C Cook/March 1, 2018), will host a Facebook Live chat with readers on Tuesday, April 3, 2018 at 8:00 PM EDT/5:00 PM PDT. During the live, hour-long conversation, Brittz will be sharing advice on parenting according to the temperament of each child and why it is important to do so to shape his or her character for his or her purpose in Christ. Through Brittz’s famous tree metaphors, parents will discover how to encourage their kids to excel at being who they naturally are as they grow in their unique purpose in the world. Readers will also be able to ask Brittz questions via the moderated chat section. Copies of Growing Kids with Character will be given away throughout the night, and at the end of the evening, the winner of the Family Fun prize pack will be announced. For any parents who thought their child should have come with an instruction manual, Brittz provides a resource to understand their child’s natural bents not only to excel in life but also to establish their identity and purpose firmly in Christ better. Learn more about Hettie Brittz and Growing Kids with Character by visiting www.hettiebrittz.com or following her on Facebook (HettieBrittzAuthor) or Twitter (@hettiebrittz).